Recycling from Facebook again. I think this is the only book review that I’ve voluntarily completed. I’m such a fan of this little book and strongly recommend it for a wide readership. Originally published as a Facebook note on February 9, 2011. 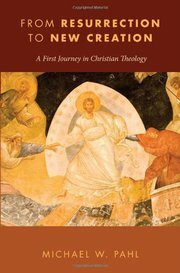 Michael W. Pahl (Ph.D. in theology from University of Birmingham), pastor at Lendrum Mennonite Brethren Church in Edmonton, Alberta has written the best little introduction to Christian theology that I have seen. I picked up his From Resurrection to New Creation: A First Journey in Christian Theology (Eugene: Cascade Books, 2010) at SBL in Atlanta this past November, and have read pieces of it while I’ve been home since then. In only 100 pages (yes, it’s nearly a booklet), I think he offers a much more vivid, relevant, and holistic explanation of the Christian faith than any 1000+ page systematic theology. Most of my enthusiasm for this succinct book, therefore, is the way it approaches Christian theology through story, basically recounting the overarching narrative of God’s redemption and renewal of the world by focusing on seven topics which are the names of the book’s seven chapters: Resurrection, Crucifixion, Son, Gospel, Father, Spirit, Creation As is evident from the title, Pahl focuses on what has always been the center of the Christian message but what has too often been ignored, especially in the past few centuries of evangelicalism with its narrow focus on the good news being all about God saving the individual from sin. Christianity is immensely bigger than individual salvation from sin though it definitely includes it, and it first and foremost both satisfies the deep human desire to know the larger story and to play a part in it. Though for a number of reasons people have so often reduced Christianity to a list of doctrines to believe in order to “be a Christian,” I don’t believe that is really what people want, need, and more importantly, what God has provided for them. Right doctrine is certainly a part of the process, but Pahl simply and elegantly demonstrates how Christianity is at its foremost about the Story. I doubt one would find a better book to use in small groups or in classes for a basic primer on Christian theology. Pahl begins and ends each chapter with some discussion questions, the materal is easy to read, and he offers both scriptural references and book lists for further reading at the end of each chapter. Pahl keeps his writing simple, and (as he emphasizes toward the end of the book) what he unfolds is the core of true, biblical Christianity as it is (or at least should be) observed by Catholics, Orthodox, and Protestants. In this way, the book is a fine measuring rod for determining what actually constitutes the Christian church; Pahl does not discuss marginal issues that divide Christians–he only shows what unites us all. As a result, plenty of groups that like to identify themselves as Christians, such as Mormons, Jehovah’s Witnesses, and Christian Scientists will find little to agree with in this book. This is “mere Christianity” wonderfully explained. And I also I think it’s wonderful, I’ll add, that this comes from the desk of a pastor, not a full-time academic. “the New Testament authors were themselves ‘doing theology’ as they explored the new terrain laid out before them in light of Jesus’ resurrection. Thus, the Trinity and other distinctive Christian doctrines and practices are, in a real sense, first a matter of history before they are a dogma of theology” (x). “Attempts to ‘prove’ Jesus’ resurrection historically, to find analagous events of resuscitations and visions, to determine a historical cause for this event, are not only wrongheaded historically, they are wrongheaded theologically” (11). “The stories of creation and exodus reverberate in the New Testament descriptions of Jesus’ resurrection, pointing back to the motifs of transcendence in the foundational Jewish descriptions of God: God’s power, holiness, and sovereignty over all creation” (60). “How do even know God exists? And if God does exist, how can we know God? That is, how might we discern God’s activity in the world in order to understand who God is? The early Christian answer to these sorts of questions was simple, yet profound: look to the crucified and resurrected Jesus … Of course, this answer is already a response of faith; that is, it will not convince someone of the existence of God who is not already predisposed to that belief, particularly in view of the reality discussed earlier that one cannot prove the resurrection of Jesus either by critical history or analytical logic. Nevertheless, this is exactly what is called for in the Christian proclamation of the crucified and resurrected Jesus: a genuine response of faith and trust, not the false security of a claim to irrefutable knowledge ” (67, 69). “So we should not expect to find God only ‘in the gaps’ of our knowledge of the natural world or human history. God is as much present in the scientifically and historically explainable as he is in that which has not yet been explained. Nor should we expect to see God only in the ‘miraculous,’ or in the triumphs of life. God is as much present in the mundane and in life’s tragedies as he is in those experiences which are typically seen as the more likely demonstration of divine activity” (70). “Indeed, the resurrection of the crucified Jesus is the ground and center of all truly Christian thought and action, both the source and the focus of all belief and behavior that can be called authentically Christian. All disctinctively Christian theology and practice should grow out of the reality–and be centered on the reality–that the crucified Jesus has been resurrected from the dead” (102).